Lodging In The Adirondacks | The FAQs For Our Hotel In The Adirondacks! The Fern Lodge is unique among Adirondack resorts and lodges. We invite you to browse our faq’s for details and information regarding your reservations, policies and details of your visit. Call (518) 494-7238 or contact The Fern Lodge with any additional questions regarding our Adirondack Mountain resort lodging. How do I make a reservation at your Adirondack Mountain resort? Can you give me directions to your lodging in the Adirondacks? What is offered for breakfast? Can you accommodate our dietary needs? Can I bring my dog to the Adirondack Mountain resort? Its our anniversary (birthday), is there anything special I can do for my husband (wife)? Is there Guide Service available? You can check availability or make a reservation online, contact us, or call our resort: (518) 494-7238. We do request a deposit by check or credit card number to confirm your stay. A written confirmation with directions to our hotel in the Adirondacks will be either e-mailed to you or sent via USPS. Due to our rural location, cancellations affect our lodge significantly. A last-minute cancellation gives us little chance of filling the space in our remote location. For these reasons, we must uphold a strict cancellation policy. If your plans change and you need to cancel, please notify us at least 14 days prior to arrival to receive a full refund of deposit. If a cancellation is made less than 14 days prior to your arrival date or should it be necessary for you to depart earlier than your confirmed reservation dates, you will be responsible for all of the original room nights charges booked from your intended stay. Please note: if we are able to re-book your room, we will refund your deposit to you as well. One exception: for a stay with an elopement the elopement portion of the charge ( $450) is non-refundable once confirmed as we proceed to make all the arrangements immediately. Click here to visit our directions page for a detailed listing of directions. We are a non-smoking property, inside and out. If you smoke, we are unfortunately not the best option for your comfort. What is served for breakfast? Can you accommodate my dietary needs? We serve a multi-course, made from scratch, breakfast. On any given day, there is often a first course of fruit, a baked goody, our house-made granola and cereal with yogurt or milk, a choice of juices, and a specialty from the kitchen. As an alternative, we can always do eggs “any style”. As everything is cooked to order; we are happy to accommodate any food allergies or dietary preferences. We always are ready for vegetarians, vegans, gluten -free, celiac, dairy free, soy free, nut free, and any other “free”. We appreciate knowing any dietary preferences in advance if possible. Can I bring my dog to your Adirondack Mountain resort? 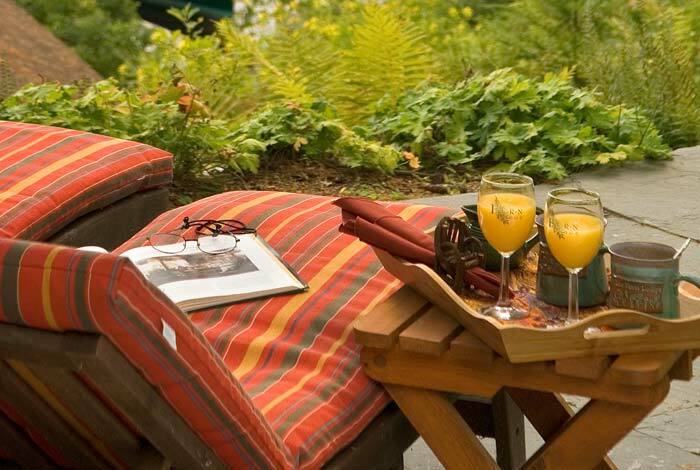 As pet lovers ourselves, we understand how wonderful it is to share an Adirondack vacation with your canine companions. However; due to the intimate nature of our property, dogs are not allowed. We have 2 Labrador Retrievers; a yellow 13 – year-old named “Shadow” and a black female (6 years old) named “Noche”. They are welcome in the common rooms – but will not visit the guest rooms. They are always available on a first-come first-serve basis for hiking or skiing companionship! All restaurants (even fine dining) in the area are relaxed casual. Bring casual sports clothes, sturdy boots for walking, sneakers for the boats and warm gloves, hats and ski jackets for the winter. Bring a bathing suit for the outdoor hot tub – towels and robes provided! Whatever the season, bring sweaters as the night air can be crisp. Robes, slippers, hair dryers and irons are available in every room. 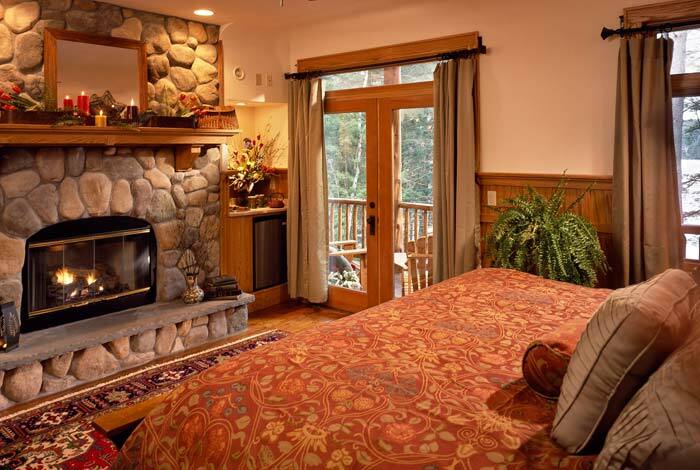 Most of the rooms at our Adirondack hotel are designed for one couple each with only one king-size bed. If you are a single parent traveling with your well-behaved child that can interact on an adult level with the other guests, they are more than welcome. There are no predetermined check-in nor check-out times. However; please do let us know when you are arriving. If you wish to enjoy the property on the day you are departing past 11:00am, and we have guests arriving for your room, we simply ask that you vacate the room itself. We will store your luggage and there are plenty of places to change your clothes if you wish. You’re more than welcome to stay and enjoy The Fern Lodge well into the afternoon. 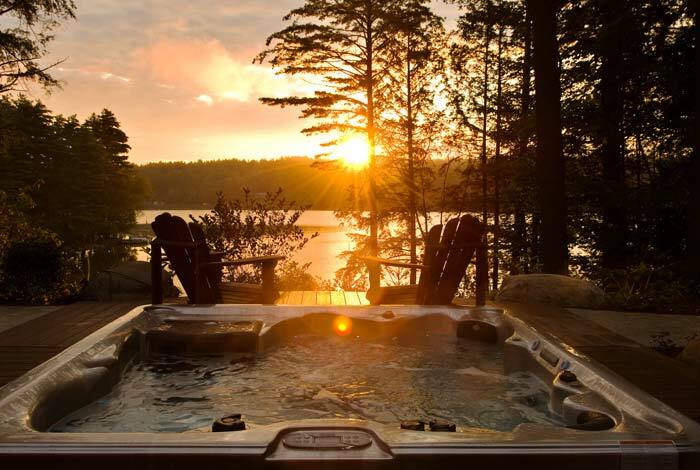 What better way to celebrate a birthday or anniversary with your loved one, than by sharing romantic quality time at one of the finest Adirondack resorts and lodges available? Better yet, have your family and friends join you at Fern Lodge! If you contact us ahead of time, we can arrange flowers according to your budget, or have a special bottle of bubbly in your room upon arrival. We can provide a boutique anniversary/birthday cake on a cake stand, with all the cutlery and dishes for you to serve and enjoy your cake. You will be contacted to customize your cake’s design and flavor. Basic decoration, cake choice and icing are included. For an additional fee you can add your choice of fillings, layers and a more personalized design to enhance your special day. We can arrange an in-room massage for you with experienced local massage therapists. Just give us a call and we will be happy to check availability for massage. Massages are $90 per hour per person. We also have a personal trainer who specializes in Joint (and Core) Strength and Conditioning and specialized intensive workouts to improve your golf. We can also offer; acupuncture, aromatherapy, reiki, a hair cut/style, and manicures and pedicures in our Adirondack lodge setting. All special services arranged require 24 hours notice of cancellation. If you’re interested in hiring an Adirondack guide to take you birding, fishing, fly-fishing, hunting or perhaps animal tracking on a hiking tour, we can recommend a guide service. Advance reservations are necessary, so please contact us as soon as possible.